In the Grove, the Gypsy creates. In the rolling hills and quiet woods of northwest Alabama, just off a battered country road, stands a little house. Around that house are rings of trees -- tall pines, fragrant cedars, blossoming magnolias. In the spring and summer, the trees grow full and thick, blocking out the rest of the world. On the windows of the little house, shadows dance across the blinds giving the impression, with a bit of an imagination, that the house has become submerged in water. It is a magical place where laughter reigns and hugs are frequent. And that's when I discovered chainmaille. 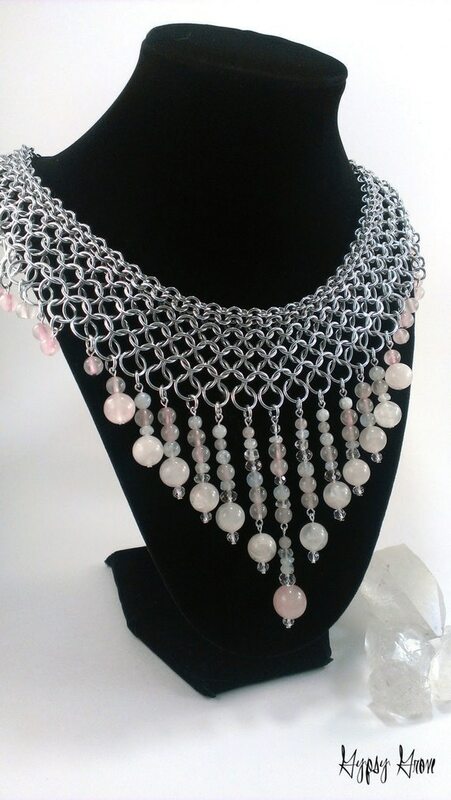 Ah, glorious, tedious, finger-breaking chainmaille! It was love at first weave. Chainmaille was the challenge I had been searching for. Three years later, it's a full-blown love affair. My goal when I created Gypsy Grove was simple -- make amazing pieces that almost anyone can afford. You shouldn't need a huge bank account to own a unique artisan piece. I strive to create a variety of prices while keeping the high quality my customers deserve. When you interact with Gypsy Grove -- through this website, Etsy, Facebook, Google+, or email -- you are interacting directly with me. The Grove is a one-woman show. Well, except at shows when my oldest daughter, Madison, joins me for backup. Other than that, Gypsy Grove has been crafted from the ground up by my own two, always achy, slightly stiff hands. It is a labor of love and passion and has brought amazing people into my life. From its humble beginnings, Gypsy Grove has grown into more than I could have ever dreamed of. I have been honored to provide gifts for popular Korean pop bands U-Kiss and Vixx while on their American tours. I have also been honored and humbled by becoming the exclusive jeweler to international author, Chantel Lysette. Pieces from the Grove have shipped out to all around the world, with more countries being added every month. As a member of The Artisan Group, Gypsy Grove is branching out to include celebrity and press giftings and will be sending items to various television shows for consideration by the stylists. It is a joy to create items that others come to love. And as long as my hands allow, I will continue to craft beautiful creations that connect me to so many beautiful spirits. Thank you for visiting the Grove and for helping me create this magical life I am so blessed to live.